Kadimi, established in the year 1977. » Kadimi Tool Manufacturing Co. Pvt. Ltd.
» Kadimi International Pvt. Ltd.
Kadimi Tool Manufacturing Co. Pvt. Ltd. 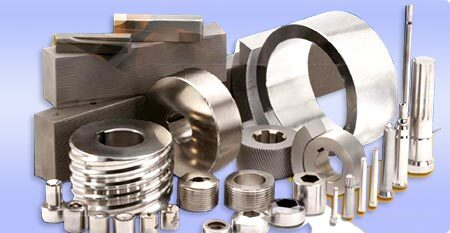 This company is engaged in manufacturing thread rolling dies for the fastener Industry worldwide. These dies are used to cold form threads, serration, knurls on fasteners, which are used by automotive & automotive fastener industry. Kadimi Tool is a Joint Venture between Kadimi & Precision Tool Group (part of Precision Castparts Corp, USA). Precision Tool Group is the largest manufacturer of thread rolling dies in the world & owns the Reed Rico & HiLife Tools brands. Kadimi International Pvt Ltd. is a trading company involved in providing a large range of industrial products to fastener & automotive companies in India. Kadimi International consists of 5 departments. Each department consists of a department head and their supporting staff. The company has its headquarters in New Delhi. It also has sales offices in Mumbai and Chennai. In addition, the company has a stock center in Gurgaon for stocking tools. Also, the Service & Tech center in Manesar provides technical support & training on fastener machines & inspection equipment to fastener makers in India. This department deals in enameled copper wire that is used in electronic and electrical industry. This department deals in cutting tools for the automobile industry, die & mold industry & general engineering industry. •	OSG Corporation, Japan - Taps, Drills, Endmills, Roto Flow Dies, Indexible Tools. •	Showa Tool, Japan - Toolholders, Machine Accessories. • FSK, Japan - Grinding Wheels & Honing Sticks. •	Dijet, Japan - Indexible Milling Tools. •	Tapmatic, USA - High Speed Tapping Systems. Kadimi International is focusing on power generation through renewable sources of energy such as wind, hydro, solar, etc. Currently Kadimi owns a number of windmills in Tamil Nadu, India. Through its investments in renewable energy, Kadimi International is proud to be Carbon Neutral.